Embracing my inner wine snob with Deviation Road wines. I love drinking wine. I very much appreciate a good bottle of wine made with love and care, cracked open at the optimum moment. However, I don’t hold the ability to look at a wine list with confidence. I’m not sure I ever will. Seriously though, from working at my fair share of restaurants and sitting through countless wine and spirit tastings, I know that the best way to learn about different wines and discover what you like and don’t like is to line them all up next to each other. Deviation Road? Never heard of it. But if Mayfair Lane is putting it on, it must be good, considering they’ve got one of the best wine lists in Perth. Obviously, I wasn’t going to walk into the lion’s den on my own. Those wine snobs can be mighty intimidating, so I gathered together my four closest wine-loving friends and off we went into the cold Perth night. We arrived to a warm, bustling bar and were directed to the restaurant’s private dining room, which had been arranged to accommodate 20-30 people standing. We were poured a glass of the 2014 Deviation Road ‘Loftia’ Vintage Brut Chardonnay Pinot Noir Pinot Meunier, smiled as if that meant anything at all to us, and had our names ticked off the list. We slowly and tentatively crept to the back of the room, well aware that we were going to be the group with the least amount of wine knowledge. As more people began to arrive and fill the room, Smokey Bay natural oysters were brought around to guests as the staff explained that all the food on offer tonight was matched with the wine we’d be trying. Lovely. Soon after, we were brought to silence by the commanding voice of restaurant owner and major wine geek Foni Politt. Foni welcomed the room and introduced us to one half of Deviation Road’s winemaking couple, Kate Laurie. 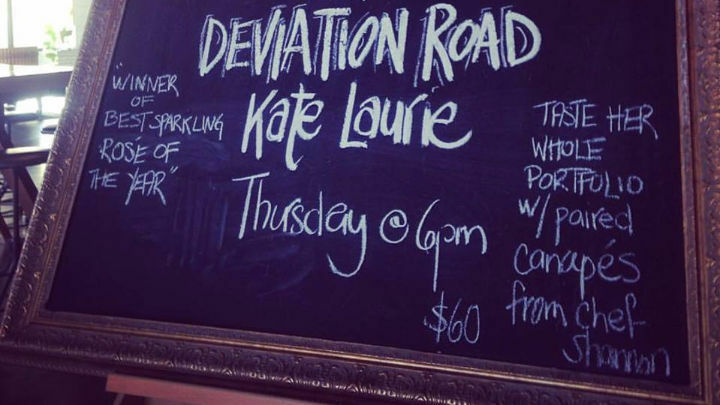 Kate stepped forward and, as she modestly explained to us about her winery in Adelaide Hills, her winemaking studies in Champagne and how Deviation Road was simply named after the road that the winery's located on, it was fair to assume that everyone in the room was instantly charmed. She apologised for taking up our drinking time and hoped that we’d enjoy our night, and boy did we. The line-up featured six of Deviation Road’s finest, includingd two award-winning sparkling wines. The food pairing was designed by the talented Mayfair kitchen and combinations such as smoked salmon tartare on herbed blini matched with the 2016 Sauvignon Blanc were positively dreamy. From the end of the two-hour event, we were well and truly satisfied and had tried some beautiful wines, thanks to Deviation Road. Kate made a conscious effort to walk around to every group and have a glass of wine with them, answering any questions that we may have been too shy to ask in front of the room. There seemed to be all ages and levels of wine knowledge present in the room that night, but let me tell you, after six or seven glasses of wine, we were all equal fans of the grape. В интеренете нашел полезный интернет-сайт про направление http://progressive.ua.